Back in town after out week long training in Cleveland. We visited the plant where the windows are made as also took a trip to the glass plant where they make the exclusive SuperSpacer(TM) glass units. This is what sets the UniShield window apart. It's been tested to out perform 98% of spacer systems on the market 10 fold. It's time to show West Michigan how to start saving on energy cost today! Call us for your free no obligation estimate. I've been down in Cleveland this whole week for some training on our new exclusive Unishield windows and doors. I am very excited to offer this exclusive product to the West Michigan area! We are able to offer some of the most efficient and quality built windows and doors available on the market today. Be sure to call us, and have your family and friends call us to learn more about the exclusive UniShield and find out how you can start saving today. 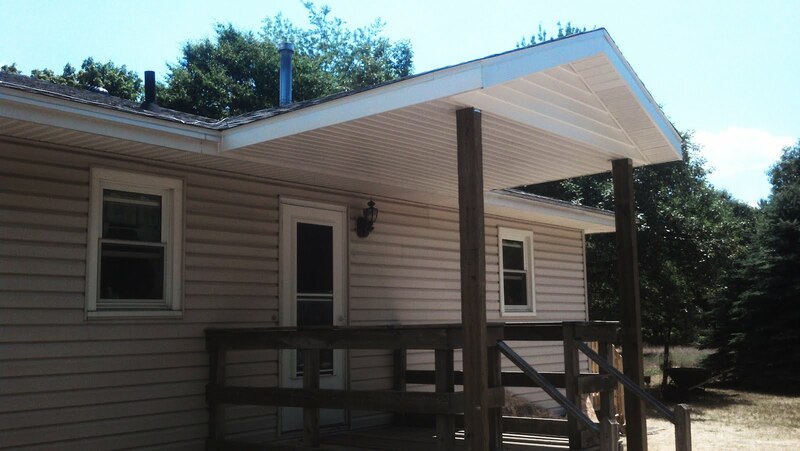 While I've been here, the guys finished up the covered porch in North Muskegon which turned out great! We also started a 40'x60' pole barn with a 10' lean to in Fruitport township today. We have one more day of training tomorrow and then a long drive back. We made some more good progress on the covered porch in North Muskegon. It is all framed up and has a roof on it! We started installed the beaded soffit and getting it prepped for the finish trimmings. We also finished up the framing for the rotted wall that we has to rebuild. We installed the new window jambs and the new windows. We just need to finish installing the exterior trim and those will be finished. We will also be constructing the composite deck tomorrow as well. Another scorcher out there today! Despite the heat we got quite a bit done today. We got the new entry door completed inside and out. We got the new covered porch all framed up with the exception of a few minor details. We also got the wall in the garage that was rotted out reframed. Tomorrow we will finish up the window openings to install the new windows, as originally planned. We will also continue putting together the covered porch and begin finishing it off with the trim and siding. Here is a photo of the covered porch that we finished up on Friday. We started another covered entry way also in North Muskegon today. We started out by installing a new front entry door and storm door. We got the footings poured today for the roof portion. We had an unexpected issue with another part of this one; we were going to install two new garage windows but found that the entire wall was completely rotted out and had extensive termite damage. O'Malley's Pest control came out and treated the area and we will now be rebuilding the wall. We made some more good progress today on the covered porch and patio in North Muskegon today. We finished up the framing and got the porch area ready to for roofing. We decided to wait for a little cooler morning weather for that! We building the new landing for the door that we installed yesterday as well as re installing the siding that we took down to cut the door in. We had another crew back in Robinson Township working on the 32'x40'x14' pole barn. We were waiting for the concrete to go in. One more day there tomorrow and we will have that finished up. We started a new project on Duck Lake Rd. in North Muskegon. We are building a roof over an existing deck to make a covered porch. We also took out a window and installed a door in its place. The new door will lead out to a new concrete patio. We installed 10 new replacement windows in a house in Muskegon Township today. They are a new line available exclusively by Chandonnet Builders to all of West Michigan. They are call UniShield by Universal Windows Direct and have an exclusive warm edge spacer system called Super Spacer. This allows for some of the most energy efficient windows on the market. They are also 100% customizable with exterior and interior color options and are also available with wood grained interiors. We were selected as the exclusive dealer for the western half of Michigan. We are very excited to have the opportunity to provide this to West Michigan! There will be plenty of more information to come on this.